A.J. and I are both work for newspapers, so I really wanted to make an invitation that reflected both of us as writers, as well as a tribute to the written word. 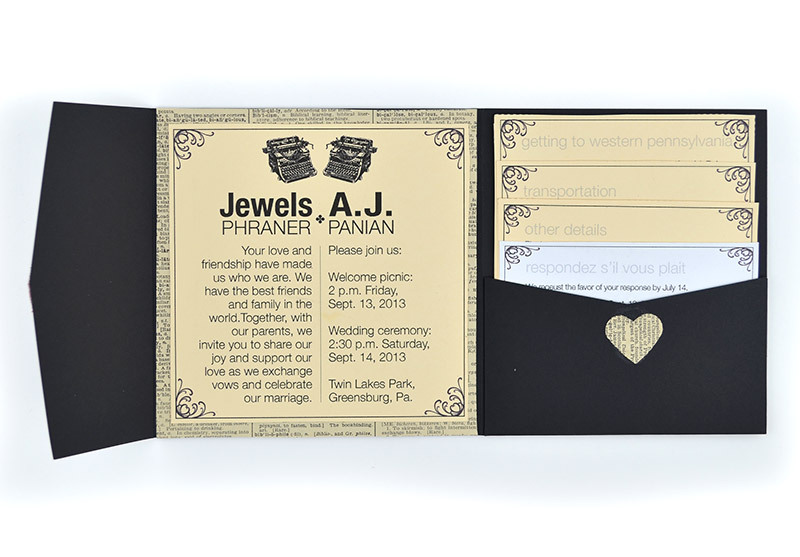 Our wedding colors are black and white (like a newspaper! ), but we’re getting married in an outdoor, rustic space, so I wanted to incorporate that in there as well. I looked at a lot of invitations for inspiration and content, but I designed them myself. To assemble them we went to a family member’s house and we all worked together on the assembly line to put them together! It was a really fun way to spend the day and certainly quickened the process! 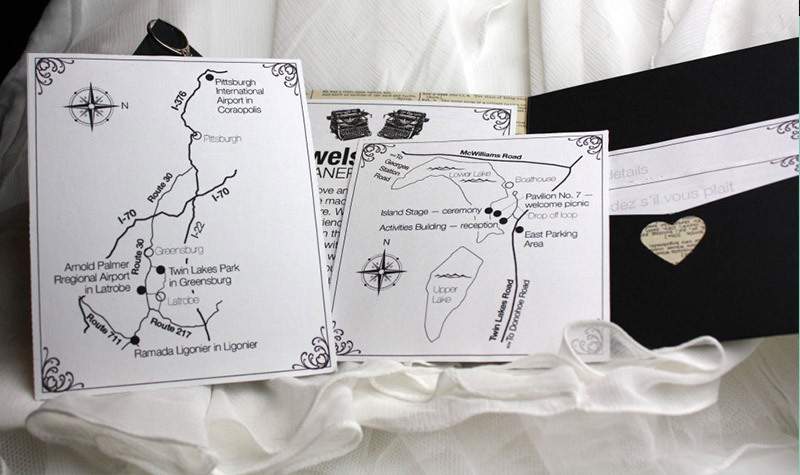 I designed the invitation and the inserts, based on the helpful dimensions given by Cards & Pockets for the Perfetto pockets using InDesign. We cut out the invitation and the insert cards from a letter-sized piece of paper. Our invitation measured 5.625″x5.625″. The insert cards measured 5″x5.75″, 5″x5″, 5″x4.25″ and 5″x3.5″. To assemble, we cut a dictionary page 5 7/8″x5 7/8″ and glued that to the center of the Perfetto pocket invitation as a mat. Then we glued the invitation to that. 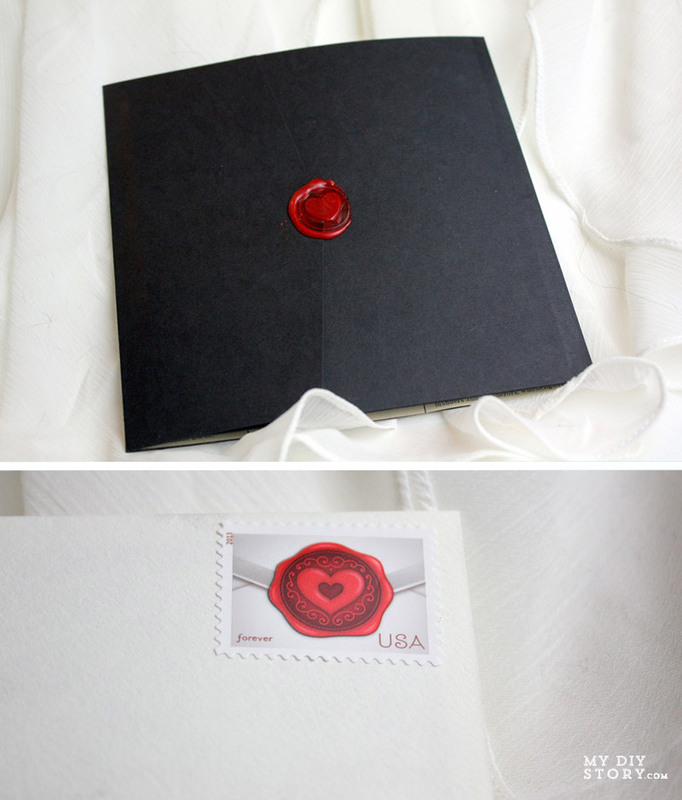 We used the 1″ heart punch to cut out hearts from the dictionary pages and glued those to the center of the pocket, and then stuffed all the cards in, and sealed it with the wax seal. Let people help! 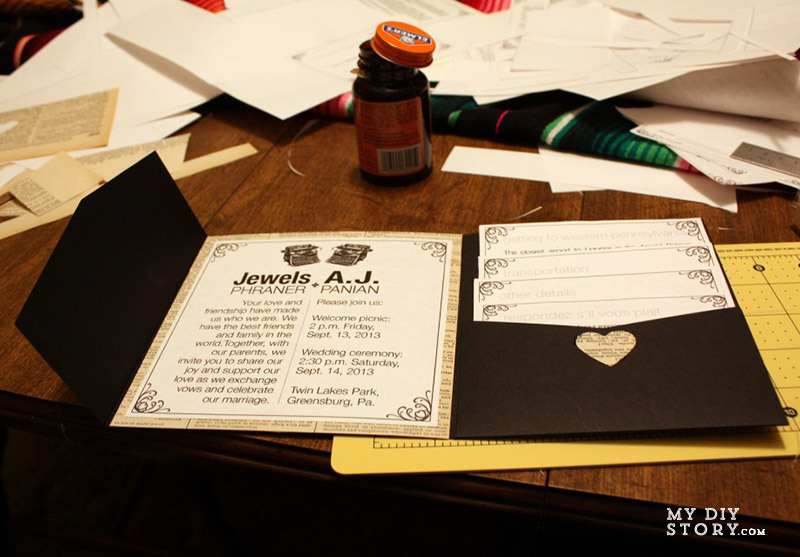 We had the greatest time (even the kids who are 5 and 6) putting together the invitations together! At Cards & Pockets we love DIYers. We also know that one of the best ways to be inspired is to see and learn about other people’s experiences. 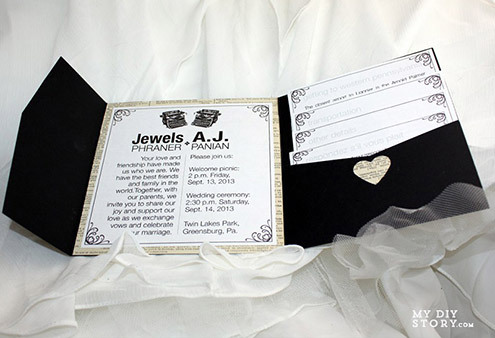 We are excited to share stories of our customers unique DIY invitation process. That is very gorgeous! I am in love with it! You can definitely see all the hard work that went into it.